Provisional Allotment and Payment Service For Left Over and Non-Reported Vacancies, Download Final Admission Letter (Left Over and Non-Reported Vacancies) TS DEECET 2017 Final Phase /Phase-3 Web Options results, certificates Verification for Left over Vacancies #TSDEECET 2017 Phase-3 Colleges wise #Seatallotment list, Final Seat allotment Letter/Order released-Provisional Allotment and Payment Service(Phase-III) Download Final Admission Letter (Phase-III) TS DEECET 2017 Phase-3/Final Phase Web options Online Option Started Exercise web options from 13-09-2017 to 16-09-2017 TS deecet 2017 Phase-III Web options @ tsdeecet.cgg.gov.in Web counselling, Certificates verification, Web Option Dates for Exercise Web options @tsdeecet.cgg.gov.in Seat Allotments TS deecet 2017 Certificates verification dates for Web counselling TS DEECET 2017 Counselling Web Option Dates for Exercise Web options giving @tsdeecet.cgg.gov.in ,List of Certificates, web options entry Online schedule TS deecet 2017 1st/2nd/3rd phase Web counselling dates for Web options giving: TS DEECET 2017 1st/2nd/3rd #phase Web #Counselling Schedule/Dates Announced for D.Ed Admissions: 1st Phase, 2nd Phase Certificate verification process was completed and now First Phase, Second Phase and Third Phase TS DEECET 2017 Web Counseling Schedule/ dates are announced for giving web optionsthrough online mode and Phase-I, Phase II, Phase III to be completed as per schedule. Telangana State School Education Departments has issued the DEECET 2017 Web Counselling Dates(schedule) notification for conducting web counselling through Web Based Admission Mode for admission into two year Diploma in Education Course for the academic year 2017-2018 in Govt DIETs and Private D.Ed Colleges.TS DEECET 2017 Admit Cards download for Certificates verification, List of Certificates, Admit Card for Verification of Certificates, TS DEECET Web options Download admit card for verification , List of candidates for Verification DIET wise WARANGAL ,ADILABAD , HYDERABAD , KARIMNAGAR , KHAMMAM , MEDAK , MAHABUBNAGAR, NALGONDA ,NIZAMABAD , RANGA REDDY : Telangana State Diploma in Elementary Education Common entrance Test (TSDEECET - 2017) merit list and results have been declared on the official website of TSDEECET 2017. The TSDEECET 2017 results(rank cards) are available on Tsdeecet.cgg.gov.in. TSDEECET 2017 is conducted by DSE Telangana for candidates who intend to take admission into 2 years Diploma in Elementary Education (D.EL.Ed) in Government District Institutes of Education & Training (DIETs) and Private Elementary Teacher Training Institutions in the state. The candidates are advised to check the TS DEECET 2017 website for further details about counselling. All the candidates who have secured rank in DEECET-2017 for admission into two year D.Ed. course during the academic year 2017-2018 batch are informed that the 1st Phase of web based counseling will be taken up as per the schedule given below. The interested and eligible candidates shall submit their preferences through the link given at http://tsdeecet.cgg.gov.in as per the schedule given below. The candidates are advised to give more preferences so as to get more chances for allotment of seat. The schedule and detailed procedure may be downloaded from the above website.TS DEECET 2017 Phase-3 Web options Online Option Started Exercise web options from here. Submission of preferences through Web Based Counseling is not the end of admission procedure. It is only registration for admission. Allotment of seats will be made exclusively in the order of merit through a web based programme. All the candidate who are allotted seats in any of the colleges as per merit and the order of preference of colleges will be sent through SMS on their mobile. Candidate shall visit the website http://tsdeecet.cgg.gov.in to know ‘provisional allotment’ and make fee payment as mentioned therein from 04-09-2017 to 05-09-2017 . TS DEECET 2nd Phase Allotment Order 2017 is available on 04-09-2017 . So, the students who completed their Counselling process successfully can download the Telangana DIETCET Admission Letter 2017. All the candidates who have qualified in DEECET-2017 for admission into two year D.El.Ed. programme for 2017-2019 academic batch are informed that for "Left over and Non-Reported vacancies", web based counseling will be conducted in all the Govt. DIETs as per the schedule given below. The candidates intending to take admission in the "Left over and Non-Reporting Vacancies" shall bring all original certificates of educational qualifications and get verification of certificates and exercise option in the DIETs and submit their preferences through the link given at http://tsdeecet.cgg.gov.in as per the schedule given below. The candidates are advised to give more preferences so as to get more chances for allotment of seat. 4. SSC or its Equivalent Certificate for proof of Date of Birth. 5. Certificates of Qualifying examination (Intermediate or equivalent) as submitted in the ONLINE application. 6. Transfer Certificate/TC from the institution where last studied. 7. Study Certificate from Class 4 to 10. In case of private study Residence Certificate issued by the MRO. 8. Integrated Community certificate issued by MRO for candidates claiming admission under quota For reservation of BC / SC / ST categories. 9. PH Certificate issued by the District Medical Board in case of candidates claiming reservation under quota for PH category. 10. Special Category certificates issued by concerned authority for candidates claiming admission under quota of reservation for Special Categories (CAP, NCC, Sports,). 11. Income certificate issued by Tahsildhar after 01.01.2017 of parent/s of SC & ST candidates whose income is less than Rs.2,00,000 per annum from all sources and Rs.1,00,000 in respect of BC candidates claiming exemption of Tuition fee (Rs.2385.00 in case of Colleges under Government Management and Tuition fee Rs.11000.00 in case of Colleges under Private Management for One year). The DEECET 2017 qualified candidates, who were going to certificates verification they should attend the certificates verification at you concerned districts Govt DIETs with your TS DEECET Admit card along with required documents. 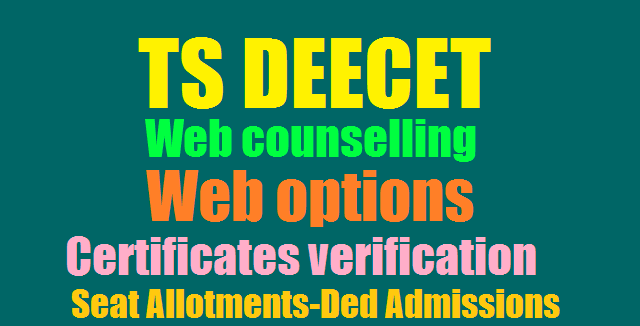 After verification process, they should give the web options in the Phase I/II/III web based counseling stream, After they can download your Provisional Allotment Letter(Seat allotment Letter) from TS DEECET Website and check your name in your college list. They should the allotted colleges along with required documents. All the candidates who have qualified in the TSDEECET-2017 are hereby informed that "Verification of Certificates" at the District Institute of Educational Research and Training (DIET) concerned will be started from 11-07-2017 to 15-07-2017. TS DEECET 2017 Certificates verification for Web Counselling for D.Ed Admissions: 1st Phase Phase Certificate verification process would be started from 11th July, 2017. First Phase, Second Phase , Third Phase TS DEECET 2017 Web Counseling Schedule/ dates to be announced soon for giving web options through online mode. Telangana State School Education Departments is going issue the DEECET 2017 1st phase Web Counselling Dates(schedule) notification in July 1st week for conducting web counselling through Web Based Admission Mode for admission into two year Diploma in Education Course for the academic year 2017-18 in Govt DIETs and Private D.Ed Colleges. a. 8,282 students appeared in English medium (Telugu Methodology), while 6,340 students were eligible. b. 310 students were appeared in the English medium (Urdu methodology) while 198 students were eligible. c. In the Telugu medium, 20,936 students appeared for exams while 16,171 students were eligible. d. 2,311 students were appeared in Urdu while 648 students were eligible. D.Ed course 2017 admissions will be taken up through web based counselling that is online admissions process by the Education department officials as per the given schedule. DSE Telangana has decided to conduct the TS DEECET 2017 Counselling Process. So, TS DEECET 2017(D.Ed Course Admissions 2017) Counselling process to be started in July and 2nd phase counselling would be started from July 3rd week 2017 and it will be completed totally end of this month.